When Sugarland released Love On The Inside in July 2008, they unleashed upon the world the best contemporary country album of the latter half of the last decade. That set’s second single, “Already Gone” was their masterpiece, a gorgeous 4:36 waltz chronicling a woman leaving home for the first time and as the song progressed, the end of her marriage (“Pictures, dishes, and socks/it’s our whole life down to one box”). A fully-formed tour-de-force, Love On The Inside captured all of Jennifer Nettles and Kristian Bush’s strengths and showcased an act well on their way to superstardom. With the bar set impossibly high, and after releasing a live of album pop/rock covers and a collection of Christmas tunes, they went back in the studio and created their new release The Incredible Machine. Led by “Stuck Like Glue,” a song now famous for a extremely controversial reggae breakdown at the bridge, Nettles and Bush appear to distant themselves from everything that made Love On The Inside great; the intimacy of the arrangements and souring twang. Of course, that isn’t such a bad thing, Nettles and Bush never want to make the same album twice. This time around they add another layer to the Sugarland brand and oh what a layer it is. This album takes everything conventional about country music and turns it on it’s head. Ever the experimenters, Nettles and Bush rely heavy on their non-country influences making a record more akin to the likes of U2 than George Jones. The opening track “All We Are” leads with a progressive drum beat that build upon the foundation set by “Love” from Inside and the title song, their ode to the human heart, adds a romantic sheen not present in Sugarland’s early work. They also prove they aren’t scared to enter full-on rock mode with the terrific “Wide Open,” their contribution to the Winter Olympics Soundtrack from earlier this year. Sure it’s loud and a tad head banging, but it can get a crowd going like nothing else; the first real extension of the energy from their live show on record. Nettles’ voice is in it’s finest form throughout, bringing with it new textures never before explored. Sadly, the added presence of Bush’s gravel takes a bit of time to warm up to and seems somewhat out of place when isolated from Nettles. He gave a fine vocal four years ago on “These Are The Days” (From Enjoy The Ride) but it seems too roughed up in this current form and almost dirty, but I give them props for trying something new. 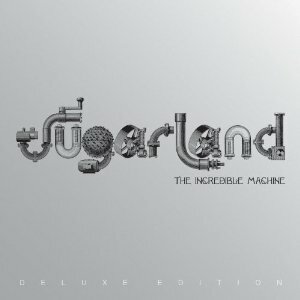 As a strict purist, I should be scolding Sugarland for moving away from tradition, but I love this album for daring to be different and injecting a somewhat sterile genre with a healthy dose of imagination. Change can be unsettling and Nettles and Bush know it’s often the only way to move forward. By creating Machine they enter a new league; taking their steadfast loyalty to writing and recording smart songs of utmost quality to the pop/rock world while still playing for the country team. On Machine Sugarland is an artist not afraid to push boundaries and open a conversation about the limits of music. I cannot wait to see where they go from here. If their October 14 concert at Boston University’s Agganis Arena is any indication, Lady Antebellum are in for a long career. In a year that saw their sophomore album Need You Now sell more than three million copies and three of the album’s singles hit number one (“Need You Now,” “American Honey,” and “Our Kind of Love”), they mounted a fiery headlining tour, that like their booming career, just doesn’t stop. The energy is palpable and each member of the audience can feel their excitement. They opened the show on a small half-circle stage singing their breakthrough hit “I Run To You” in stunning fashion. The placement of this song at the top of the show was a bit odd given that ballads don’t usually cement the energy needed to get the nearly sold-out crowd on their feet. But with a song as strong as “I Run To You” that doesn’t really matter. They followed it up with the should’ve been opener, their anthem, “Stars Tonight” which got the whole arena on their feet. The similarly paced “Love This Pain” came next giving back-to-back explosions of loud rocking country. From there they rolled through song after song treating the audience to their previous number one, “American Honey” as well as album cuts “When You’ve Got A Good Thing” and the awkward “Perfect Day.” In concert “Something ‘Bout A Women” became a showcase of where they came from and got an in the round bluegrass treatment. That was the version that should’ve made the record. The highlight of the show came when they each went solo for a bit showcasing themselves and their influences. Hillary gave the audience a stunning rendition of the Bonnie Raitt classic “I Can’t Make You Love Me” while Charles Kelley powered through Bruce Springsteen’s “Hearts on Fire.” Both songs fit each singer and proved worthy additions to the Lady A songbook. Usually when an act is touring in support of an album, they tend to plug that record while only going back to previous albums through the hit singles. Not so with Lady A. While they gave the audience nearly all of their current record Need You Now, they even went back and dusted off some tracks from their self-titled debut that weren’t singles including “Love’s Looking Good On You,” “Long Gone,” and “Slow Down Sister.” It proved that their first album should’ve gone deeper than three singles. They closed the regular portion of the show treating everyone to “Looking For A Good Time,” their only song not to hit the top 10 and their debut single, “Love Don’t Live Here,” which I’d forgotten about until they sang it. Their last song pre-encore was not just their biggest hit but the biggest song to come out of Nashville in years, “Need You Now.” The opening piano notes were all the audience needed to erupt and it brought back memories of when Garth Brooks would do “The Dance” or the opening chords of “Friends in Low Places.” That song is going to remain popular for a long, long, time. The opening act, David Nail, didn’t stray too far from his self-titled debut album in either sound or production. Rolling through a bunch of similarly paced album tracks it took until half way during his set for him to play his lone top 10, “Red Light” and to the end for his current top 20 hit, “Turning Home.” He has a very powerful voice but he did little to prove why he should be country music’s next big thing. I didn’t leave his set any more impressed with him than I already was. He’s very likable but nothing about him screams he’s going to be huge. If he’s going places, he needs to prove it. Believe me, he’s far from awful but he isn’t essential listening either. He gave the best line of the night when he said, “This isn’t your grandfather’s country music.” That line was uttered once before during a Dixie Chicks special 11 years ago but it was still worth a chuckle. I was excited to attend the show because this was the first real showcase of who Lady Antebellum are as an artist and a chance to prove if they deserve the hit singles, album sales, awards, and hype. All and all they really do. I enjoy their second album, which I found very lukewarm when it came out 10 months ago, more and more with each listen and love it even more now that I’ve heard them sing it live. What struck me though is their talents lay as singers and songwriters much more than as musicians. I don’t believe Scott or Charles picked up a guitar or played a piano all night. The heavy lifting was left to Haywood, who more than proved his worth. 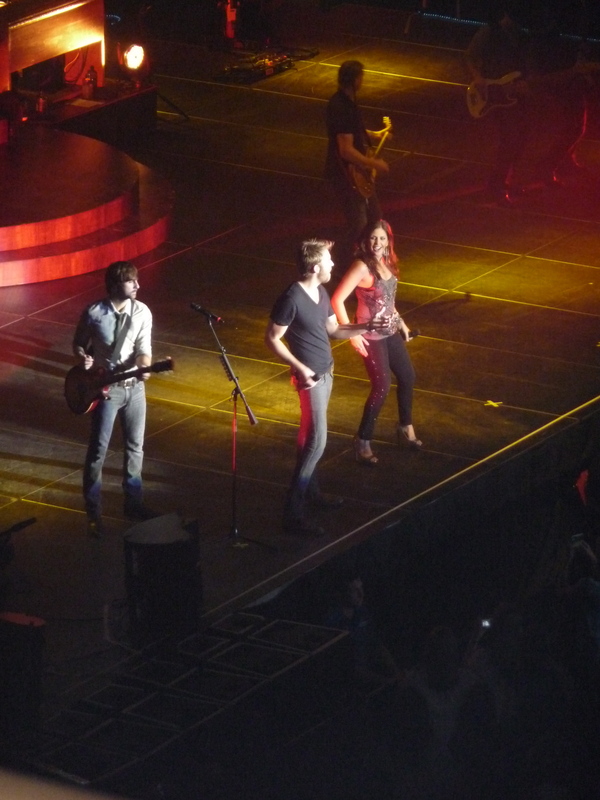 Of course, it is all about the singing and the songs and with Lady A, that was their main focus. I loved every second of it and would go back in a minute. I just wonder how the AMA organization can justify giving Lady A so many pop/rock nominations when they are clearly a country band. So what if “Need You Now” was a major pop hit…that doesn’t a pop/rock artist make. Also, did they really have to make a “pop” video for “I Run To You?” The first one was just fine. Anyway, it was a really dynamic concert even if I feel like I missed the best part. Lady A are going places and I plan to travel on the journey along with them. Well, that was fast. October 8 marked one year to the day I launched this blog. I’m having a hard time believing that 365 days have passed since I made my first post. The passage of time is a quick one and a year of my life flew by within a blink of an eye. Since I began this blog I’ve graduated from college and began the process of finding my place within the real world. This blog saved me and gave me a place to write when I didn’t have The Courier anymore. Looking back to that first post, I made a pact that I would use this blog to practice my proofreading skills. That is a lofty goal and one I plan to continue into year two. But this year I want to take the blog to the next level and really make my writing even stronger and maybe tackle subjects that require deeper thought. What I know for sure is that there is always room to grow and get better. Even when you feel like you’ve written your best piece there is always something greater waiting in the wings to get published. I want to thank everyone for a wonderful first year of blogging and I look forward to seeing what the future holds in year two and beyond.